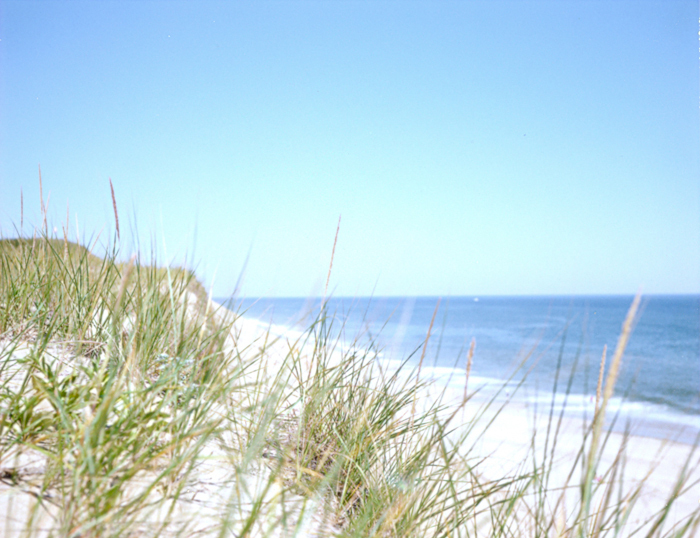 In the late 1950s, my grandparents began a yearly tradition of renting a small cottage on the Cape Cod National Seashore, escaping New Jersey’s heavy summer humidity for a few weeks on the open Atlantic shore. Each year, they would bring my father and his younger siblings until they began to move away to start lives of their own, one by one. 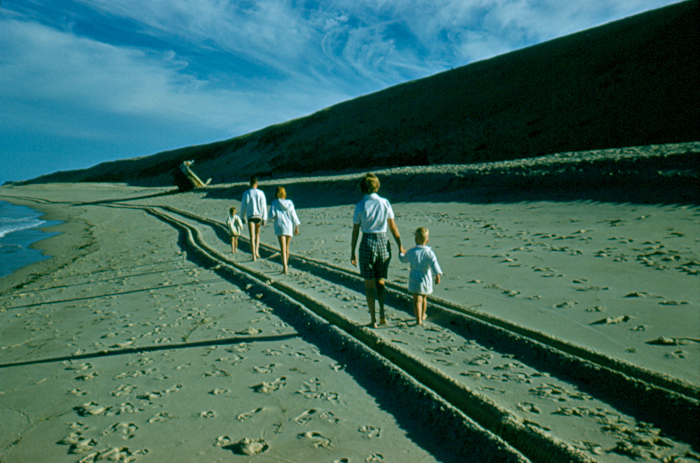 I was the first grandchild brought to the cottages near Marconi Beach, starting another generation of family tradition. I have vivid memories of getting lost in the dunes, listening to Grammy’s baseball games on the radio and reading books in the low light of the living room. We all loved that place, but it was Grammy who loved it most. For nearly 30 years, my grandparents migrated to Massachusetts for the summers, where a small smattering of rental cottages became a second home. When my grandfather passed away in 2002, I stumbled upon a stack of metal tins while rummaging through the basement of their house. In them were hundreds of Kodachrome slides Grampy had taken over the years on his Exakta VX, all in pristine condition. None of us had any idea what a photographer he had been. 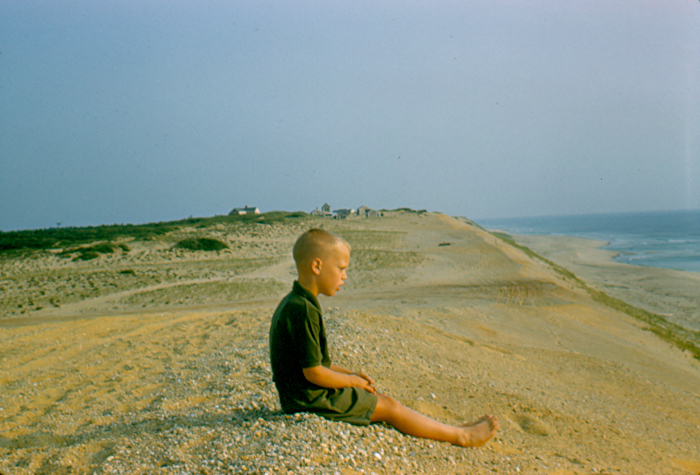 And of course, my favorite shots of the bunch were the ones he took over the years of summering in South Wellfleet. 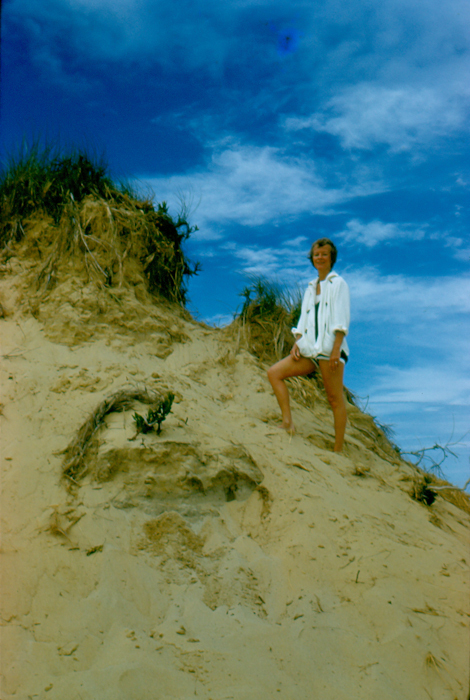 This past weekend, my mom’s family gathered on the Cape and we took a short detour to the cottages perched high on the dunes, 125 feet above Marconi Beach. It had been 20 years since my last visit, and it was refreshing to see everything was exactly the same as I remembered. The same family still owns and rents the cottages, which remain remarkably lo-fi and simple, without telephones or TVs. We walked out onto the dunes to the beach, all of us awash in memory, quite certain that at least Grammy is there to this day, listening to her baseball games, knitting and enjoying the sea. 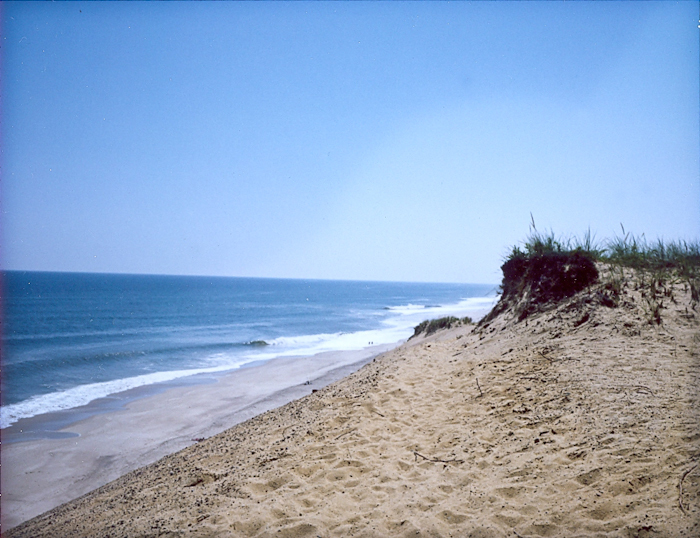 Here are some of my grandfather’s photos from Wellfleet, as well as a few polaroids I snapped on the Konica this weekend. I’ve loved hearing about your travel wishlists. 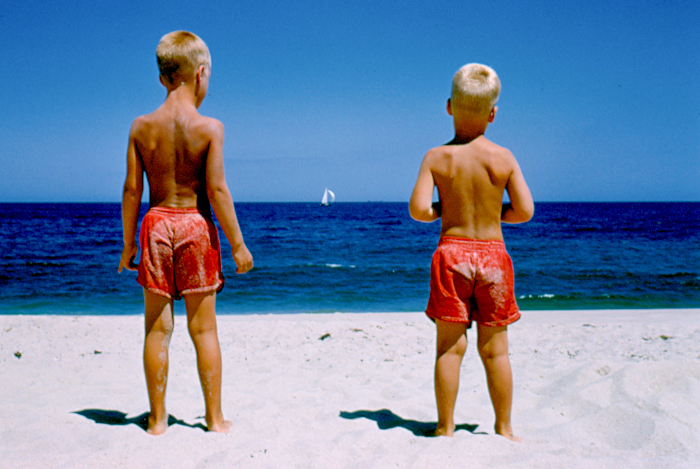 As summer winds down, I’m curious to know what places define summer for you. I grew up on the New England coast and frankly, it does not qualify as summer unless I spend a good chunk of it here. Where is your summer? 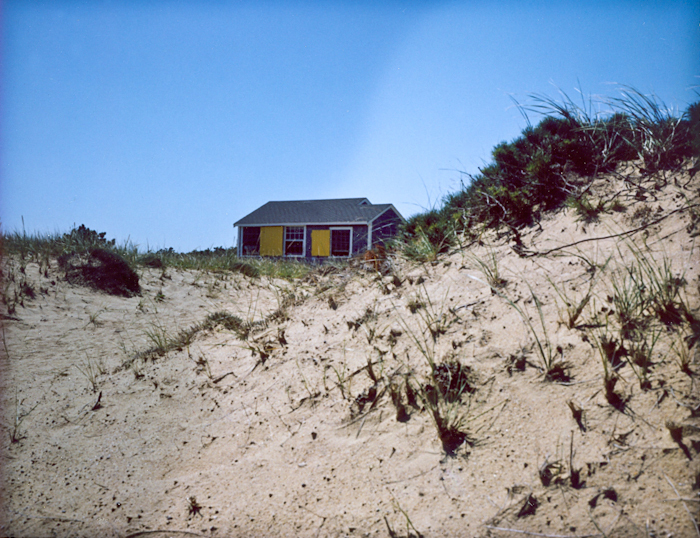 This entry was posted on Friday, September 3rd, 2010 at 1:57 am	and is filed under Film, Massachusetts, Other Places and tagged with Cape Cod, family, giveaway, Wellfleet. You can follow any responses to this entry through the RSS 2.0 feed. p.s. my summer memories are all at camp. somewhere in WI. sitting around the campfire singing songs. swimming in the lake, diving off the pier. accidentally getting my cast soaking wet. (woops!) one year sleeping in teepees. getting bug bites. my brother getting the worst poison ivy that hospital had ever seen. cabins. spiders. macrame. oh! what a find. such a great tradition. What a great find! For me summers are in New England, too, and I can’t get enough of it. what a wonderful treasure you have found. 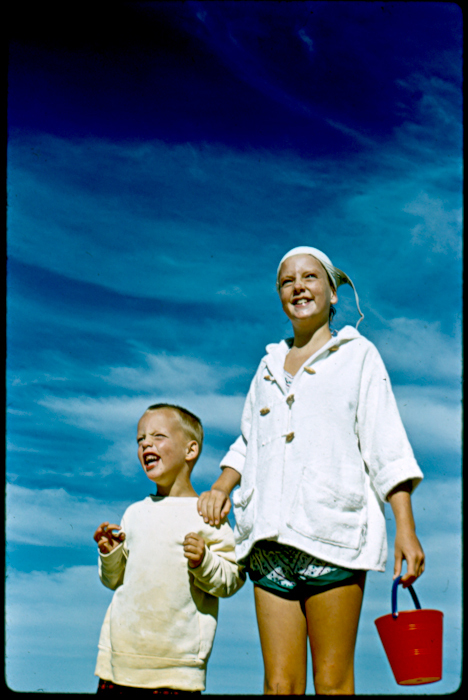 oh, kodachrome, why did they have to stop making you? i never feel like it is a complete summer unless i am at my parent’s house on the lake in indiana. luckily, i was able to go there for a weekend recently. perfect. I know Wellfleet only through the praise that people give its library. Its director won a national award in 2008, the nominations for which came from the people that live there and regular summer visitors. I guess I associate summer with Lake Michigan? And/or my parents’ backyard. what an incredible find. these are so beautiful and evocative. and that color! for me summer is louisiana… damp, sticky, scorching, and buggy… nights that smell like sweet olive and gardenia and jasmine… picnics… ceiling fans… sweet tea and sweet cocktails. not moving much. porch sitting. i haven’t spent a summer there in a long time but if i close my eyes i’m there. Nice photos. I visited your blog the first time … I don’t know why and how, the serendipity of the web :) I would like to go to South Korea now that I’ve read (and see) your experience. Keep going ! oh my gosh what beauty!!! i love these!!!! Not surprisingly my Summer is pretty much the same as yours… Front beach, Cook’s Camp and Conomo Point. Thanks for the wonderful memories and the good cry. i’m not sure i can really describe how these photos make me feel. thank you for sharing them, steph. they are full of memories. it is such a beautiful place, and i love seeing your grampy’s slides. These are too good. Love the second shot. These are truly amazing and I love seeing the one of your daddio so young!!! These photos are a treasure. Eric & I spent many a summer with our grandparents in Miami. We’d go to Miami Beach in the morning and abuelita always made us gargle the seawater (because it was good for us…and I still do). Then we’d return in the afternoon, flip on the AC, watch the Banana Splits and then play dominos or Scrabble. stephanie. i’m completely and utterly smitten. more please. oh, i love the photos. so many memories wrapped up in those. and they trigger my own memories of our family cottage with my grandparents. thank you for that. Steph – what a beautiful testimonial to the importance of childhood! When we were there looking out over the ocean I understood for the first time that when I was there as a kid I knew in my soul that Narnia could be found beyond that horizon. And that was before I’d ever heard of Narnia. Striking, beautiful photos. I love love love the one of uncles Steve and Chris. The summer-est of summer colours. And hi, my name is Joy and I’m a lurker. 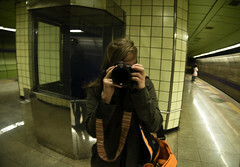 I have admired your photos for a while now. :) Your New York posts got me even more excited about my visit in two weeks, which I didn’t think was possible! yes! ditto hannah. and those blues. they’ve knocked me off my feet. Wow! What memories. 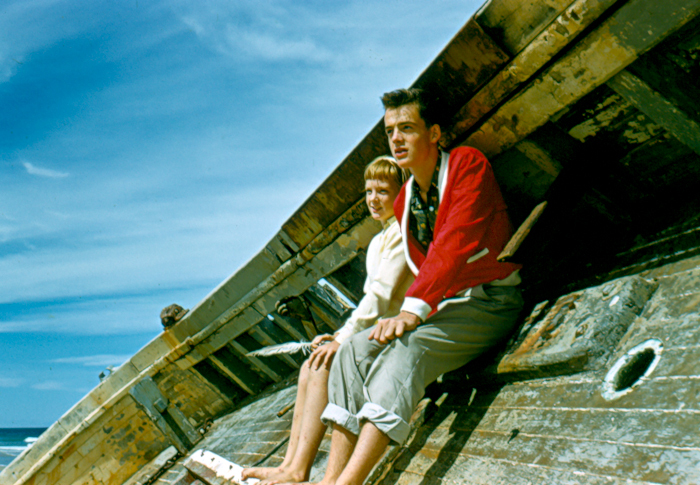 And who is that funny looking red-haired girl sitting next to your Dad on the wrecked hull of the boat? Tee hee!! Stephanie. Stephanie! I have no words. It looks lovely. I love finding hidden treasures. Thanks for sharing. im far away catching up with all the blogs and flickr but this one is far the most favourite blog post this year. this is above precious. What an amazing find! We have a family farm (a non-working dairy farm) that’s been in my family since the 1960s. That’s where all my summer memories spring from. I’m glad you got to go back after so long and revisit old haunts.